Do you love relaxing in a long, hot bath? These DIY lavender bath bombs are easy to make and you may already have all of the ingredients in your pantry! Every once in a while, we all deserve to treat ourselves a little bit. Taking a nice, long bath is an indulgence for me since time is so precious these days. So when I do take the time to enjoy a bath, I like to make it extra special. One way to do that is to use bath salts or bath bombs. I like to control what goes into my bath though, so rather than buying pre-made bath bombs, I will often make them myself. That way I can make sure everything is natural and control the quality. These DIY Lavender bath bombs are very easy to make, and if you cook and bake a lot, you may just have all of the ingredients in your pantry already! 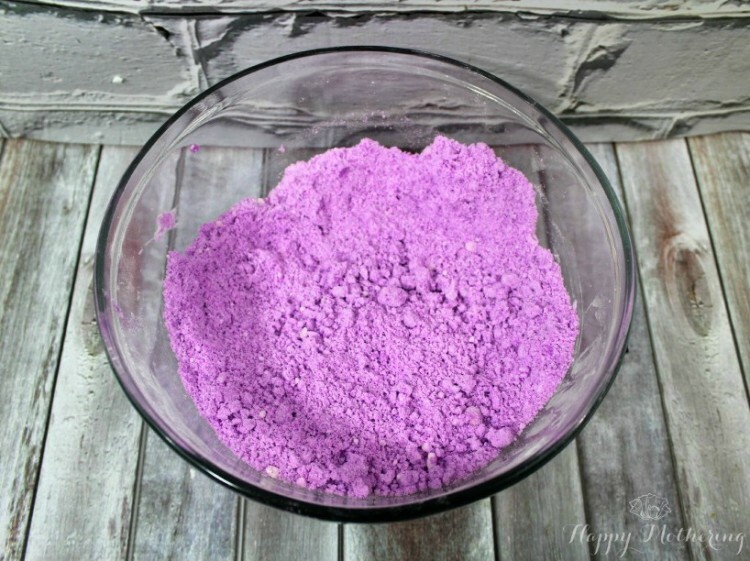 And if you’re a lavender fan, check out these other DIY beauty tutorials featuring lavender. Make a few of them and give them as gifts! Purchase lavender bath bombs instead of making your own. 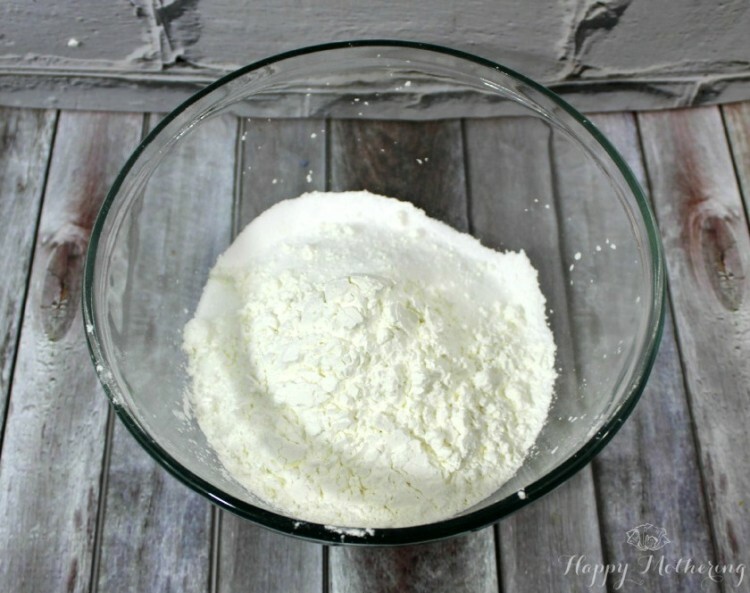 In a large mixing bowl, combine all dry ingredients (epsom salts, baking soda, corn starch and cream of tartar). In a another small mixing bowl, combine the water, oil and food coloring. Your mixture should resemble wet sand at this stage in the process. If you’re using a natural food coloring, you should be able to tell when it’s well mixed once the coloring is even. Also, it should hold together when you squeeze some in your fist. If it doesn’t hold together, add a few drops of water at a time until you reach the desired consistency. Once it’s the right consistency, tightly pack it down into your mold (the mini muffin pan). All the bath bombs to dry for 24 hours. I recommend not removing from the mold until the mixture is completely dry. However, depending on your mold shape, you may have success with early removal so you can reuse the molds more quickly. Cupcake and Flat shapes work great removing them from the mold early. More intricate designs do not. How often do you indulge in a relaxing bath with lavender bath bombs? Purchase pre-made lavender bath bombs instead of making your own. Great post. I’ve seen lots of posts about making your own things such as body scrub etc and never really been inspired to try it myself but I have to say your post has made me think, why not? Pinned so I can give it a try at a later date. Oh this sounds so wonderful! Thanks for sharing the recipe! Love this! A bath with bath bomb is one of my favorite indulgences, so this is perfect. Great way to have something cleaner, less toxic and cheaper! What type of food coloring do you use? I typically use use plant based food coloring or mica. I have 100% pure undiluted lavender EO….can I use this as is, or does it need to be in a carrier oil? I am confused when I read in recipes “body safe” oils….. In this recipe, you just follow the instructions. If you’re using lavender EO on its own, that’s when you’d want to use a carrier oil. I love these! I’m doing a post on lavender, so I’ll be including your link in my resources. These are amazing! Awesome! I hope your readers enjoy the lavender bath bombs! How many bombs does this recipe make if using a muffin tin? I haven’t used i regular sized muffin pan. Feel free to share your results here if you do! Hi! Awesome recipe. Can I use citric acid instead of tartar?? I haven’t tried it, but if you do, let us know how it turns out! I bought Epsom salt that is already lavender scented. Would that be okay or would I still need to add the lavender oil? How many mini muffin sized bath bombs does this make? love this so much . but so disappointed I cannot print.want to make so bad for christmas.please help. Is the measurement for the cream of tartar correct? I went to the store and found a 2.5 ounce bottle of cream of tartar and it was $8! That isn’t even enough to cover the recipe. Can I use less? Hi, I love these recipes, but for the food coloring and the mica powder, does it stain the skin and is it safe for skin application? Clearly this is all new to me, so I am sorry if it seems like a silly question. hi, i recently made some home made bath-bombs to give out at christmas, and i used a muffin pan and it is very hard to get the bath bombs out; how did you get them out? 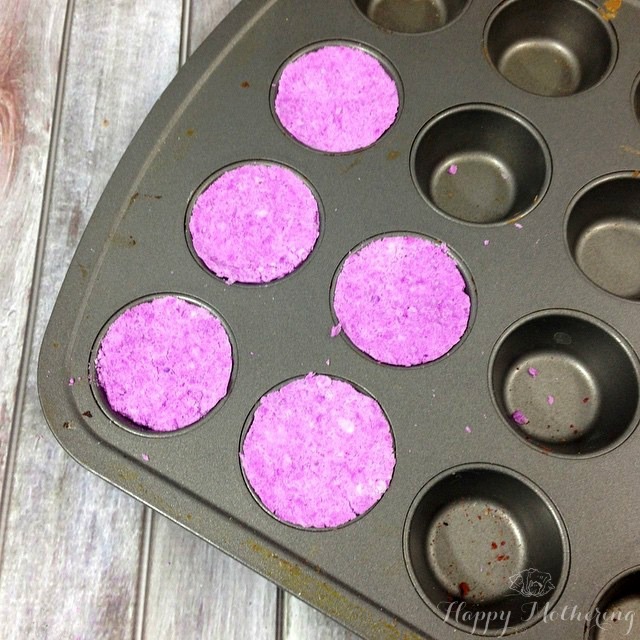 I find that using a silicone muffin pan is much easier to work with than the metals ones, so if you’re struggling with the metal ones, give a silicone mold muffin pan a try. Depending upon the area you’re in and the humidity level, you may need to let it dry longer. I have since switched to using silicone molds because it is a lot easier to get them out. These look simple and fun but why non-gmo cornstarch? What’s the point?